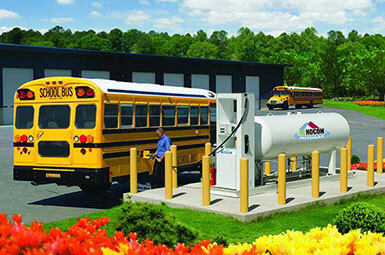 More businesses are discovering the advantages of Propane Autogas. Offering savings of 30% to 50% versus retail gasoline or diesel, this clean, efficient alternative motor fuel is ideal for commercial fleets. This includes delivery trucks, maintenance vans, school buses, taxi fleets, and shuttle buses, as well as forklifts and mowing and lawn equipment. Your customers will be impressed, too, because with Propane Autogas, you can show them you are using a domestic fuel that has lower fuel emissions than gasoline or diesel with no chance of spillage. It’s more affordable than you think! Hocon Gas can help you convert to clean, efficient propane motor fuels for your commercial fleet and help you set up a propane fueling station at your facility, or provide on-site fueling on a scheduled basis via our delivery trucks. We can also help you qualify for cash incentives. Please click here to learn more about how Propane Autogas can benefit your business. Contact us to learn more about Propane Autogas, Propane Autogas service and Propane Autogas systems. Hocon Gas—serving Norwalk, Torrington, Waterbury, Danbury, Guilford, Suffield, Shelton and surrounding towns in Connecticut, New York and Massachusetts.